Create the best squad on the planet, tinker with formations and play styles. When discussing the biggest video game franchises, Halo and Call of Duty automatically make the list, but FIFA is no slouch, even on iPhone and iPad, where FIFA Soccer 13 had the biggest global launch day in EA's smartphone and tablet history. With a fan base hungry for more, the publisher chose to give them exactly that with an update that includes FIFA Ultimate Team, the popular mode from the console hit. Available as a free expansion, this strategy mini-game tasks players with creating the best team on the planet, mixing and matching different superstars to achieve superior team chemistry. They get to obsess over everything, from play styles, formations and kits. From there, users can compete by entering their squads into weekly tournaments and Team of the Week challenges, where they stand to win coins to recruit more players. 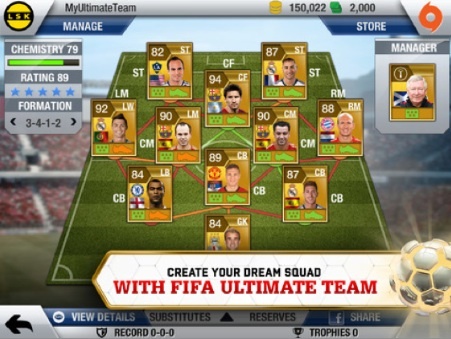 That said, you can check out Ultimate Team right now by simply updating FIFA Soccer 13.